Today we welcome guest blogger Cristina Aguirre-Chen, Ph.D., a postdoc in Assistant Professor Chris Hammell’s lab. Cristina recently participated in the American Association for Cancer Research’s Rally for Medical Research, asking Congress to increase funding for biomedical research. September 18th, 2014 marked the second annual Rally for Medical Research Capitol Hill Day, in which over 300 members of the medical research community met with House and Senate Congressional staff in Washington D.C. to urge increased funding for the National Institutes of Health (NIH). Scientists, clinicians, science policymakers and patients participated in the day-long event. The NIH is the largest source of funding for medical research worldwide, currently supporting more than 325,000 U.S. scientists at over 3,000 universities and research institutes. Not only has NIH-funded research led to crucial scientific breakthroughs that have improved the health of millions of Americans, but funding from the NIH also fuels our economy. Every $1 in NIH funding produces approximately $2.21 in local economic growth. This means that the Institutes’ budget each year spurs about $60 billion in new economic activity nationwide. Increased advocacy for NIH-supported research comes at a critical time. Between 2003-2013, appropriations remained stagnant at just under $30 billion annually, and, importantly, did not keep pace with biomedical inflation. As a consequence, the NIH has lost 20% in purchasing power over the last decade. More recently, across-the-board spending cuts for federal agencies under Congressional “sequestration” has reduced the NIH budget for fiscal year [FY] 2013 by $1.6 billion, further limiting its ability to fuel the biomedical science enterprise. Although funding for the NIH was increased by $1 billion in FY 2014, the total remains below pre-sequestration levels. 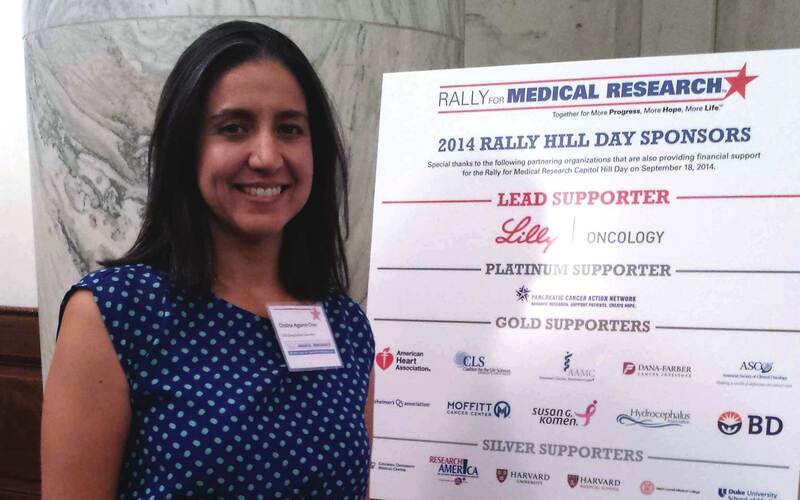 I had the privilege of representing CSHL postdoctoral fellows at this year’s Hill Day rally in Washington. My participation was sponsored by the Postdoc Liaison Committee here at CSHL. For many postdocs, cuts to medical research funding forces many to pursue careers outside of research. This trend is particularly unsettling. It has the potential to discourage the next generation of promising young scientists from committing to life-saving medical research. This point was one that I hoped to convey during my Hill Day meetings. While in Washington, I met with staffers in the offices of New York Senators Charles Schumer and Kirsten Gillibrand and Representatives Carolyn McCarthy and Steve Israel. All of the offices were very welcoming to members of the medical research advocacy community and expressed their support for biomedical research and increased funding for the NIH. They suggested that we continue to speak to people back in our home districts, where medical research may not be at the forefront of the agenda. They encourage all interested parties, whether local or not, to contact their senators and representatives about the need for greater investment in the NIH. In order to effect change, there must be a grassroots effort!